Steaming is one of the most ancient and healthiest cooking technique which could be traced back to some 10,000 years. This most probably is one of those methods that Human civilisation tried experimenting with. Steam pits, Stoneware steamers were the very old steaming utensils that were devised to cook food while retaining the taste and most importantly the nutrients. But very unfortunately we donot use this very healthy technique much in our daily cooking. Apart from steaming some Hilsa here or a batch of Idli there, This still is not part of mainstream Bengali or North Indian cooking. And all thanks to Tupperware that this trend is going to change for good in my Kitchen. Tupperware is a brand that needs no introduction. you think of food grade containers and Tupperware is the name that comes to your mind first. I use them myself for packing lunch, to save leftover food and even to carry my toddler's snacks. So when they wanted me to review their Newest range of products called 'Steam it", I was game. As a mother of two growing kids I prefer to make healthy food without loosing the precious nutrients, especially Folic acid and vitamin C. Which are very important for our nervous system, embryo development and immunity boosting. Research shows that compared to raw consumption, even boiling looses 35% of a food's folic acid, where as Steaming retains almost 85%. The 'Tupperware Steam it" is a really well thought and designed product. They come in two very attractive colours, Red and Green. The two steaming containers fits perfectly above each other. Depending on your quantity you can use both the containers together or only one. The Instruction and recipe booklet is a great help to get one started. I was little sceptical and so I lined the bottom of the Steam it containers with Grease proof paper. But guess what! the product is so good that nothing got stuck to it rather I had difficulty peeling the grease proof paper from it. 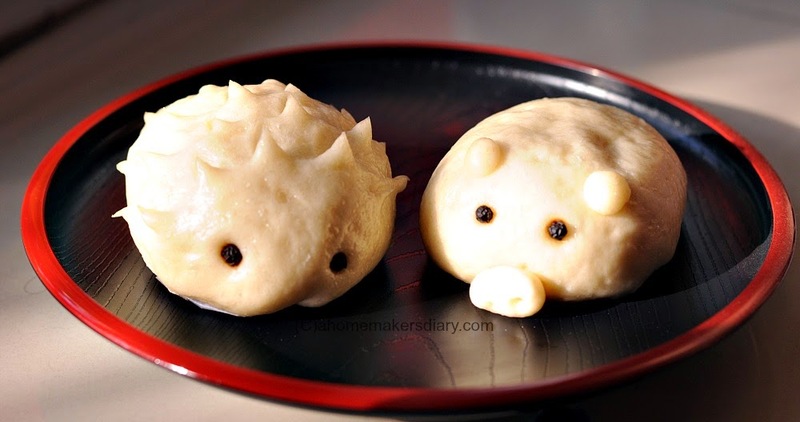 These steamed and filled buns are of Chinese origination and are known as Baozi or simply bao. Being a mother I wanted to make them look cute and used the same methods of using my kitchen scissors to make cute animal shapes out of the filled buns. This time again it was assorted designs. Some chicken filled piglets, porcupines plain buns (Nikuman) and a couple of Tibetan Tingmos and some Pork belly buns (the steamed folded buns to make pork belly sandwich). The recipe is easy and quick if you just devote little time and patience. First we need to make the dough. Take the flour and salt together in a big mouthed bolw and keep aside. Take 3/4 cup lukewarm water and mix in the sugar in it. Sprinkle the instant yeast on top and keep aside for 5 minutes. Make a well in the center of the flour and pour in the yeast mixture. Mix and make a soft dough (little sticky too) using as much warm water as needed. Lightly grease your kitchen counter (cleaned) and start kneading the dough. Try to stretch the dough with the heel of your palm. fold, stretch, bring it together and repeat. Use the butter to grease your hands and surface whenever needed. Keep doing this for at least 6-7 minutes till you get a soft, dry to touch and springy dough. Lightly grease a big bowl and your dough too. Place it in the bowl and cover with a cling wrap. Keep in a warm place for 2 hours or till it gets doubled in volume. In the meantime let's make the stuffing. Take the thinly sliced onion, cabbage and the minced ginger in a bowl and sprinkle some salt on it. Mash with your hand to bring out the natural juice of the veggies. Heat the oil and add the veggies to the pan Keeping it's juice in the bowl. Cook for a minute and then add the chicken. Add soy sauce and pepper. Mix and stir vigorously to avoid forming any lumps. One the chicken turns white pour in the reserved juice. Cook on high till the juice evaporates. If needed add more salt and keep aside to cool it down. Once the dough doubles its time to shape them. Prepare to baking sheets lined with foil, lightly grease it. 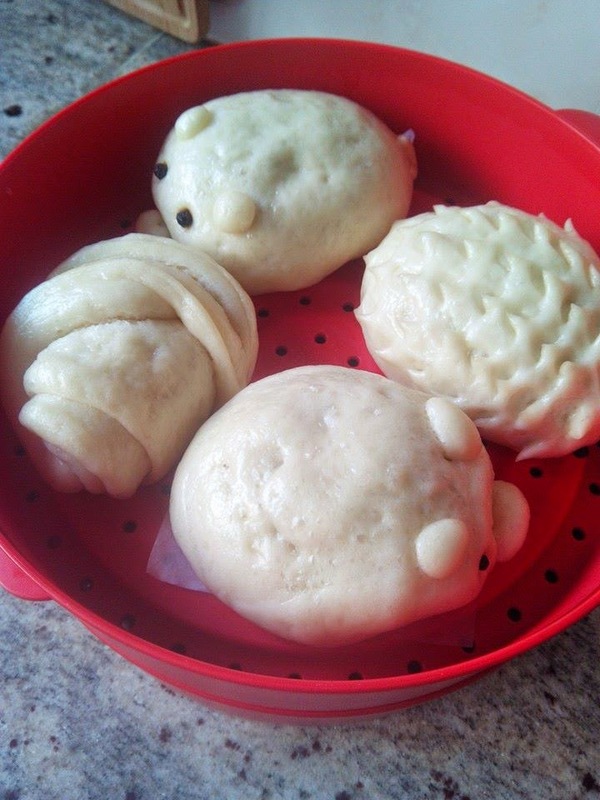 Divide the dough in 10-12 pieces depending on the size of the bun you are looking for. 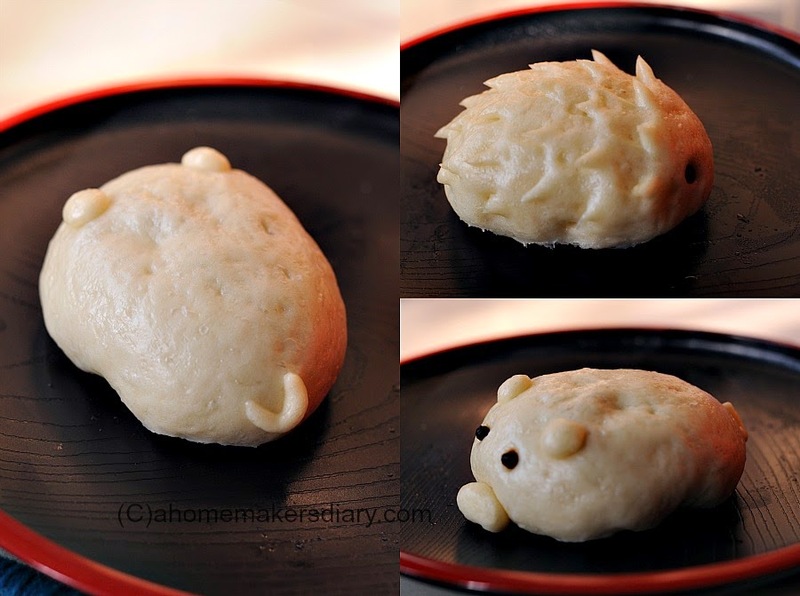 Take a piece of dough and make a tight ball out of it. Roll it out to half inch thickness. Place a big spoonfull of the cold stuffing in the center. Bring the edges together and try to push out any tapped air inside. Pinch to secure the bun. Roll between your palm to make it a smooth round ball. Place it on the lined baking pan, pinched side down. Take a scissor and start cutting the surface in a line. Make sure you don't cut through the dough. Just cut in 45 degree angle and in lines. Use two black pepper for eyes. Place the prepared and filled dough on the baking pan. Take little more dough. Roll and flatten it to make the piggy's nose. Same for ears. Use pepper for eyes and make two holes with a toothpick for nose. Roll a portion of the dough till 1/3" thickness. Place some stuffing in the center. Take the whole thing in your hand and start pleating the edges at the center, almost like making a potli or pouch. Once it's covered pinch it to secure the edges. You can sprinkle the top with sesame seeds. to do so brush the top with water and sprinkle the seeds. Please see this video for the rolling and shaping technique. 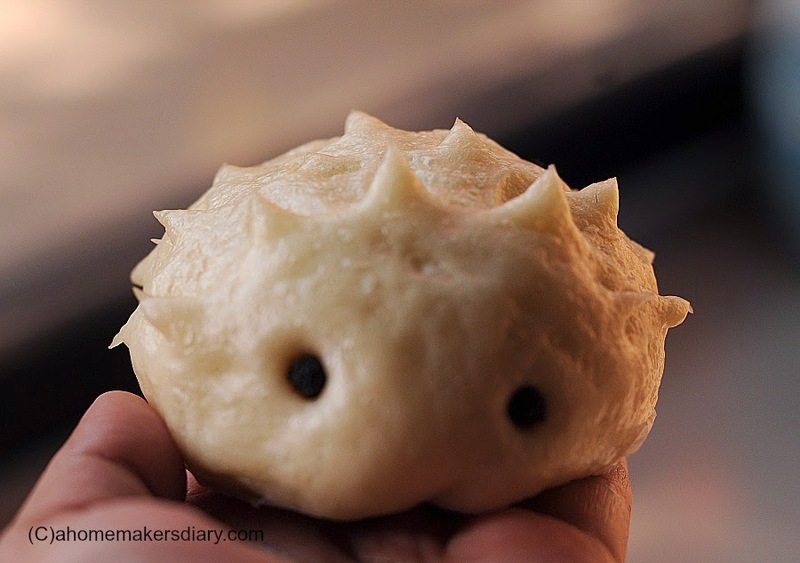 Take little dough and roll between your palm. Roll it out to 1/2" thickness. Brush the top surface with little oil or butter and then fold over in half. Once you are done shaping the dough. Cover the pans and let them rise for another hour. Clean the containers and fill a wok or Kadhai in such a manner that the container's bottom mentioned part is submerged in water. Make sure your wok's edges is not touching the steam it container. 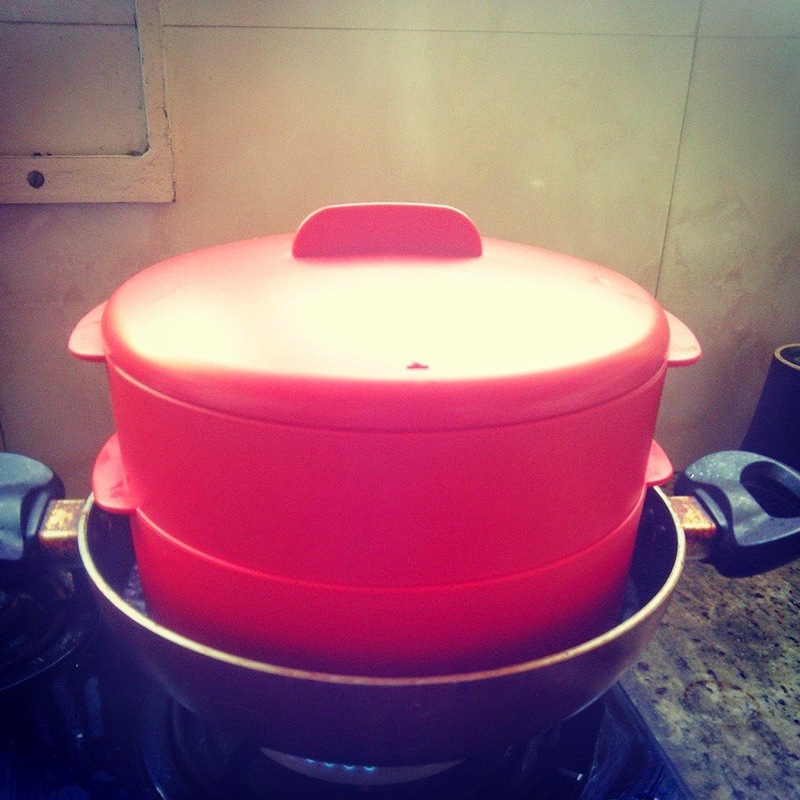 Once the water starts to boil keep the flame medium and place your steam it container with the buns inside. Keep them atleast 1" apart as they swell up after steaming. Steam for 15-20 minutes. Once the surface is dry to touch and they puff up almost twice its original size they are done. Switch off and very carefully take the pan out. Serve them with any sauce of your choice. I serve the animals on a bed of salad for a balanced meal. You can have the Tingmo with some soupy curry and sandwich the bao buns with anything you want. Think of boiled egg, onion and sauce or dry chicken. To make the recipe vegetarian use crumbled paneer or Tofu in the same way. These baos tastes best when piping hot so if you plan to stock, then do so in an airtight container once they are cool. Once out of the fridge, Steam them for a brief minute before serving.